A remarkable new documentary assembled from Gertrude Bell's letters read over archive footage makes us wish for what might have been. 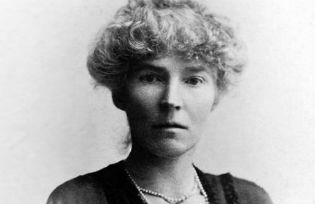 The conservative historian David Pryce-Jones says that “those who marched in European capitals to demonstrate against the war with Saddam Hussein were Gertrude Bell’s heirs, even if they have no idea who she might have been”. It is not a compliment coming from him. The quote is from his book, “The Treason of the Heart” which devotes several chapters to those English colonial arabists of the nineteenth and early twentieth Century, many of them influential at the highest echelons of the colonial establishment (TE Lawrence (“of Arabia”) and others) who, he argues, hated their own country, romanticised the other in an absurd orientalist ideal, and did their best to mess up the serious business of the pursuit of Britain’s national interest in the Middle East. “Letters from Baghdad”, a beautiful and deeply moving film of Gertrude Bell’s life – magnificent and adventurous, but ultimately desperately tragic – suggests a very different and much more nuanced view. One thing the film makes clear is that Pryce-Jones is unlikely to have been right even in the central barb, that she hated her own country : just before her death, Bell is weak, depressed and emaciated. She returns to the Yorkshire family home – Rounton – that she clearly loved and sees family to whom she is also deeply attached. But despite her terrible state of health, she has to return to Baghdad, where she is director of the newly established National Museum of antiquities in the newly established monarchy whose southern border only she had even the beginnings of the expertise to draw on behalf of the Foreign Office. No one else had the depth of knowledge of the ins and outs of tribal loyalties, connections and attachments to places to make a border for the new country that even stood a chance of standing. She has to return, because Baghdad has become her elective home and Iraq her elective nation. The film, using voice-overs from her letters to entrancing images and film from archive footage, quotes her near the end of her life, at the opening of the museum, proud and moved that she had shown around “a family of 15 ordinary Iraqis”, taken them through the rooms of antiquities that she managed to prise out of the colonial administrators who would much rather have transferred all the best pieces to the British Museum. The Pryce-Jones interpretation of this behaviour is that it is romantic piffle, a “treason of the heart”. The film suggests otherwise: Bell really did make Iraq her elective home. Her romantic, sentimental attachment is to the other home, Rounton, a childhood idea of England. Far from being a story of treachery, “Letters from Baghdad” intimates all that might have been had the meeting of British might with late-Ottoman Arabia been one of sensitivities like Bell’s rather than of the loyal administrators of Pryce-Jones’s so-called national interest. The film is a story of these two attachments of hers: Rounton versus Baghdad; her beloved father, the rich Victorian industrialist versus Faisal, the king she “makes”; swaggering, patriarchal, Colonial England versus the victim subjects – not only herself, as a woman (“you must understand, I am not a person” she writes to her father, though she struggles for personhood and achieves it), but all the other subject peoples facing the overwhelming might directed to short-term, narrow interest. The attachments become knotted; the betrayals that haunt her attempts to bind these attachments through love not dominance give the film the grand tragic narrative that echoes far beyond Bell’s own life. Just before the installation of Faysal, the not-yet-Iraqi tribes rebel. The colonial administration wants to adopt the position vacated by the Ottomans and demands of each tribe a poll tax. These are the the tribes that had been promised sovereignty. That is why they’d fought the Ottomans and sided with the allies: to be rid of their masters, not to swap them for some new ones. When the tax goes unpaid, the aerial bombardment of villages starts. The film has some haunting footage of the shadows of warplanes on dusty desert dunes. Echoes of the high-tech video footage of Gulf War 1 and its “precision” bombs; of Gulf War 2 and “shock and awe” … this was the first war conducted exclusively from the air. Bell writes home, distraught, already blaming the curse it is that oil has been discovered in this land. Churchill had seen from the start of the war that oil independence for the empire would be the great strategic prize of the war as well as a tactical military requirement. There was never anything innocent in the War Office’s late recruitment of Bell to the Cairo office to work alongside TE Lawrence (who, in what is presumably for him the highest of compliments, writes of her that she is “not very like a woman”). As a pioneering mountaineer in the 1890s (the Gertrudspitze in the Bernese Oberland is named in honour of her first ascent), her stepmother worries she finds “too much value to difficult and dangerous” pursuits. Her attitude to her so-called superiors is rather like the one she has to the mountains: powerful figures of frightening authority that she confronts and needs to overcome. She combines an attitude of fearless exploration, of willingness to stare down claims to authority, with the uniquely unthreatening position of being seen as a “weak woman”; this allows her to form relationships in Arabia in a way that had not been done by an English person before her. The film quotes the archaeologist David Hogarth’s warning to Bell about a white woman “penetrating Arabia proper” and lingers on the verb: that is how he and his type thought about these travels – a penetration, not a mutual exploration. She is taken hostage; she spent time in the women’s quarters, whose inhabitants have been passed from “man to man” during the simmering tribal wars in which “murder is like the spilling of milk”. The film suggests that Bell’s attitude is not Hogarth’s: she wants mutuality, not dominance. The First World War and its aftermath are a story of disappointment and depression for Bell. Early on, she sees the war as the “end of the order we’re accustomed to” – a Whiggish order in which she had believed that British power could be exercised for good; she witnesses and fears the general abandonment of the belief that “there’s room enough in the sun” for everyone. She remembers archaeological digs with German friends and asserts the Bloomsbury faith that, for her group, at least, “friendship is stronger than war”. Scales fell from her eyes earlier for her than for others of her class. She immerses herself in work “I can’t do without [its] narcotic and no thoughts are bearable”. As the war gives way to the realpolitik of the grab for oil-rich Ottoman lands, she tries to warn that “no people likes permanently to be governed by another”. Dutifully, she draws the boundaries of the new Kingdom of Iraq to balance Sunni and Shia numbers – “to avoid a theocratic state”. But in the end, she concludes that “making kings is too great a strain” because, we feel, she knows that Britain’s promises of sovereignty will be empty. The Baghdad museum of antiquities that she founds – the place so thoroughly despoiled in 2003 – becomes a symbol of the tragedy the film tells: the talent and sympathy of the likes of Gertrude Bell don’t count for much against the onward march of power and the interests of those who wield it. “Letters from Baghdad” is a documentary by Sabine Krayenbuhl and Zeva Oelbaum, with Tilda Swinton as the voice of Gertrude Bell. It opens in UK cinemas from April 21st 2017.
Letters From Baghdad – Official Trailer from Letters from Baghdad on Vimeo.